Lene Hardy observes from the light booth while Jessie Mutz assists Zack Meyer with fight training. Also shown: Kim Boler and (part of) Maggie Speer. Star Wars. Drupelets. And a little show with the clever title of FupDuck. These are just a few of the dozen recent shows that Lene Hardy has stage managed. If you didn’t know, being a stage manager is like being a bass player – you’re always gigging. Stage Management is a special talent. It requires attention to detail, responsibility, ability to influence and please a great number of various personalities, and it requires most of all a love of theatre. Lene Hardy has those qualities in spades. With Polarity Ensemble Theatre of Chicago’s spring 2012 production of Tom Jones, adapted from the Henry Fielding novel by playwright David Hammond and directed by Maggie Speer, stage manager Lene Hardy brings her best game, including her skills at prop design. So let’s learn more about this fascinating contributor. Oh, and Captain Neat-o Man. We mustn’t forget him. If you don’t know how all the roles of theatre fit together as a perfect working machine, perhaps we should start with what a stage manager does. This often unheralded role is actually one of the most critical to a smooth-running production. Often the director can’t be there at every show, so a dependable stage manager is hired. This person is the liaison between the director and the backstage crew, which includes the actors. Present at every performance, the stage manager (or SM for short) keeps the schedule, the logistics, and most of the director’s entire vision intact for every performance. It’s a demanding job for something with little spotlight. Starting in the 17th century, the role was defined and has been leveraged at countless performances over hundreds of years – the SM is a tradition that goes as deep as roles in costuming, design, or stage combat. For Polarity’s production, Hardy is certainly not alone. To realize Fielding’s immense novel, there is a large cast of 17 actors, who represent even more characters. “Communication can be difficult,” she admits. “No matter how articulately a statement is worded, the more people hear it, the more chance there is that it will be misunderstood. A lot of my job involves relaying information, which sometimes means asking five or six people the same question and getting answers that seem almost deliberately contradictory.” Hardy compares it to the class game of ‘telephone’ – where a phrase or idea is round-robin’d to determine what’s lost in translation. Hardy is the operator. How to handle this challenge? Hardy is beholden to the wishes of director Maggie Speer. When handling a specific vision, Hardy’s job is to support all that happens around her, and drop as few (if any) balls of the hundreds in the air at any given time. As the production moves headlong towards its opening night, the excitement and suspense is something that requires superhero nerves to control. Maybe someone like Captain Neat-o Man! I hate to leave the reader on the hook, but I tell you this – go see Tom Jones, appreciate the fun, the passion, and the craft of the production, brought to you by a great Chicago ensemble. Then, after the performance, sneak backstage and shout, “Ms. Hardy!” The woman who answers will know the identity of Captain Neat-o Man. Guaranteed. Tom Jones performs at 1500 N. Bell Street in Wicker Park through April 29, 2012. Tickets are $19. Senior discount tickets (age 65 and older) are $15, and student discount tickets are $10 with valid ID. Showtimes are Fridays and Saturdays at 8pm, and Sundays at 3pm. Seating is general admission. Click here to purchase tickets online or call the box office at 800-838-3006. Luckily for Hammond, Fielding’s 18th century novel, The History of Tom Jones, A Founding, was one he knew very well. Mr. Jones’ navigation through high- and low-society, with its exploitative streak of bawdiness, was a defining novel of English literature for centuries after publication. Along with War & Peace, it is a story Hammond has read and re-read more than any other work. In three days, Hammond had written enough pages to begin rehearsals. The speed of the writing, while exhilarating, had also left Hammond feeling the material deserved a more measured approach. “The show was a hit and we did a successful tour, but I knew that some of that first adaptation was smoke-and-mirrors. There were places where I’d patched things together or glided over inconsistencies and missing circumstances, but the arc of the thing, and its spirit, somehow captured Fielding. All that summer, I kept telling myself that I would get back to the script and push it through to real completion.” Little did he know it would be decades before he could again find time for Mr. Jones. Hammond also brought into the play more of Fielding’s wry humor. The third-person narration of the novel being a challenge, Hammond spent considerable time on retaining the original version’s energy while sharpening the dialog and tightening elements of plot. The novel is over three-hundred thousand words (longer than the last Harry Potter novel! ), so to create a tighter, stronger, and funnier version than first existed was a call to arms for the experienced playwright. David Hammond has written adaptations of works by Euripides, Moliere, Beaumarchais, Chekhov, Ostrovsky, Gay, Wedekind, and E.T.A. Hoffmann, as well as several original plays. Hammond has taught on the faculties of the Juilliard School, the Yale School of Drama, and the American Conservatory Theatre Advanced Training Program and is Professor Emeritus in the Department of Dramatic Art at UNC-Chapel Hill. He currently teaches for the American Repertory Theater/Moscow Art Theater School Institute for Advanced Theatre Training at Harvard and is Professor of Theatre Studies and Arts Division Chair at Guilford College. Tom Jones performs at 1500 N. Bell Street in Wicker Park. Previews begin March 20th, with press opening on Thursday, March 22nd and a Gala Premiere Night Friday, March 23rd. Tickets are $10 for previews, $19 for regular run, and $35 for Gala Premiere Night which includes a post-show reception. Senior discount tickets (age 65 and older) are $15, and student discount tickets are $10 with valid ID. Showtimes are Fridays and Saturdays at 8pm, and Sundays at 3pm. Seating is general admission. Click here to purchase tickets online or call the box office at 800-838-3006. 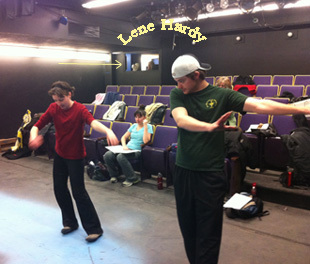 You are currently browsing the Polarity Ensemble Theatre Blog blog archives for March, 2012.